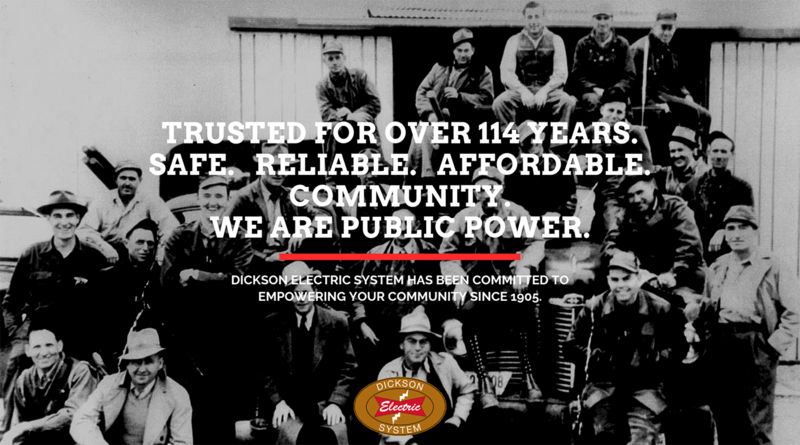 Dickson Electric System is a public utility serving 36,000 customers in five counties. Dickson Electric currently provides service to Dickson, Hickman, Cheatham, Houston and Montgomery counties. In case of emergency or life-threatening situation, dial 911. To reach Dickson Electric System, call (615) 446-9051. Buried utilities could exist just about anywhere you dig in your yard. By law, you must call 811 before doing any building, trenching, blasting, or digging. So, be safe and at least three days before doing any work, call 811 to learn where underground lines, pipes and cables are buried in your yard. Digging without this information is not only dangerous, but could also be costly. To report a power outage, call Dickson Electric at (615) 446-9051 and select Option #1. You may also email us at oncall@dicksonelectric.com. My power has been cut off. What do I do? Click here to learn more about reconnection if your power has been shut off. Click here to learn more about signing up for service with Dickson Electric.